In industrialized countries including the U.S., U.K., and Canada, dairy is a primary source of iodine, and those who are dairy-free may be at risk of deficiency of this essential nutrient. If you drink milk alternatives or eat a non-dairy diet, you may be at greater risk of iodine deficiency. A new study in the UK , and the first of its kind, found concentration levels of iodine in non-dairy milks to be only 2% of levels found in cows’ milk. 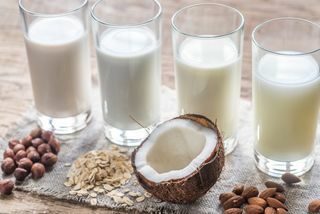 Researchers measured iodine content in seven milk alternative drinks: soya, almond, coconut, oat, rice, hazelnut and hemp, finding an average of only 2 micrograms (mcg) of iodine per serving. The adult recommended iodine intake is 150 mcg per day. In pregnancy, that recommendation goes up to 200 mcg per day. Iodine content in milk-alternative drinks: soya, almond, coconut, oat, rice, hazelnut and hemp contain much less iodine than cows' milk. These findings are most critical for pregnant women or those planning a pregnancy. Iodine deficiency during pregnancy is a leading cause of impaired brain development in the womb, and is linked to lower I.Q. in children. While the study was conducted in the UK, it also has implications for the U.S. and Canada, where dairy is also the primary source of dietary iodine. Although the overall dietary iodine intake is currently sufficient in the U.S., Canada, and the U.K. , there are concerns about mild iodine deficiency among women during pregnancy. Compounding the problem is a lack of awareness about the importance of iodine, especially among pregnant women. As consumption of milk-alternative is on the rise due to factors such as perceived allergies or intolerance to the lactose in cows’ milk, experts are urging consumers who avoid milk or dairy products to ensure they get enough iodine from their diet. Other rich sources of iodine include fish (white fish tends to contain more than oily fish), eggs, bread, yogurt, seaweed in food, and most importantly, iodized salt – which has been mandated by countries across the world and led to a dramatic global decline in iodine deficiency. More information on good iodine sources can be found in the British Dietetic Association Iodine Food Fact Sheet or the U.S. National Institutes of Health Iodine Fact Sheet for Health Professionals . The study has some significant implications for public health and the food industry. Food package labels could include iodine content to increase awareness. And dairy-free milks could be fortified with essential nutrients usually found in milk. Often these are fortified with calcium and vitamin D, but iodine is left out . Iodine content does not naturally occur in dairy , but comes from two sources: iodine supplementation of cattle feed, and residue from iodophor disinfecting solutions used in milking equipment. In the U.S., restrictions on the amount of iodine in cattle feed have led to a decline in levels of iodine in milk. As such, a glass of milk does not necessarily contain sufficient iodine levels to meet the daily need. 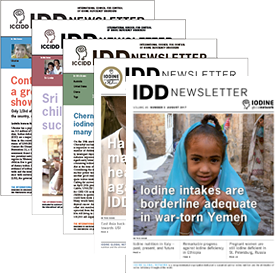 Other dietary sources should be considered, and most of all, national efforts to improve iodine intakes and assure optimal iodine status should continue to strengthen Universal Salt Iodization (USI) programs to mandate iodine in all edible salt, including the use of iodized salt in processed foods.